Nothing like a Bill Ladson inbox to start off your week! This one is dated 10/4/13 and was posted late friday. As always I write my response here before reading his and edit questions for clarity and conciseness. Here we go. Q: This past season, Adam LaRoche had a .403 slugging percentage, which might fly at shortstop, but not at first base. Do you think that Tyler Moore is good enough to be in a platoon with LaRoche, or should the Nats go after someone like James Loney to start most of the time? A: Adam LaRoche‘s season was a disappointment for sure. In addition to the noted poor slugging percentage, I’ll give you two more interesting stats. He posted a bWAR of 0.9 for the year, which is only slightly better than the bWAR of 0.7 posted by Billy Hamilton during his two weeks of base-running terror in September. And he ranked 20th of qualified first basemen in the league in terms of fWAR for the year. James Loney put himself in a position to get a decent contract this year, with a nice slash line, a 118 OPS+ and a 7.2 UZR/150 at first. But Loney’s problem is that he just doesn’t hit for enough power. The Nats need LaRoche’s power, and I think at this point they stick with what they have for one more year and hope he rebounds. I don’t think Tyler Moore is ready for prime time and will continue to be a power RH bat off the bench. Lastly; who is taking LaRoche off our hands if we decide to replace him? We’d have to pay most of his salary, get little in return, and I just don’t see this management team doing that. Ladson agrees. Q: How does Ross Ohlendorf fit in with the Nationals’ future plans? I see him as a great No. 4 or 5 starter. A: Ross Ohlendorf is in an interesting spot. He was signed as a MLFA this past off-season, but did not accrue enough service time to get to 5 full years, so I believe he’s still tied to the club. He should be arbitration eligible, and (per springfieldFan’s big board work) seems to have 2 options left. So, on the one hand he pitched pretty well for us and I’d definitely tender him a contract for 2014; he’ll be relatively cheap even through arbitration. I see him competing for the 4th/5th with the other obvious candidates (Karns, Jordan, Detwiler, Roark), but his longer term history as a starter in 2011 and 2012 does not inspire confidence. His new motion helped him to a 3-1 record with a 3.52 ERA in 7 starts this year, but ultimately I see him settling into a long-man role similar to what he had this year. Ladson agrees; he’s arb eligible but doesn’t seem like he can stick as a starter. Q: I feel like the Nationals should go after center fielder Jacoby Ellsbury. How do you feel about that? A: Nope. Jacoby Ellsbury is a nice player, but I feel like he’s somewhat of a one-season wonder. Look at his career homer records and tell me how he hit 32 in 2011 when he’s never hit more than 9 in any other season?? Doesn’t that outlier scream out PEDs? Plus he can’t stay healthy; he missed 30 games this year, half of last year, basically all of 2010. He’s a Scott Boras client who is already making noise about getting more for Ellsbury than he got for Carl Crawford. Would you pay $150M for 7 years of Ellsbury?? But here’s the other thing; as with LaRoche, this team has a center fielder under contract for 2014! 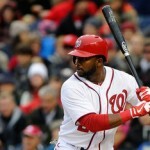 If the Nats want to make a change in center they’ll be selling somewhat low on Denard Span. Personally I wouldn’t mind putting Harper in center, acquiring a big bopper for left and adding some muscle to this lineup. But I just don’t see Mike Rizzo doing that and admitting defeat on the Span acquisition. Ladson points out that Span’s great finish means he’s clearly not in line to be replaced; organizationally they have to be hopeful that his 2014 will resemble more closely the end of 2013, not the middle. Fair enough; I can get on that bandwagon. Q: Have you noticed how similar the home run swings of Wilson Ramos and Andres Galarraga are? Every time Ramos goes yard, he reminds me of The Big Cat. A: I had not noticed, but sure, whatever. No real question here otherwise. I like Ramos, and he’s finally showing signs of durability after an injury-plagued career. This is the kind of hard-hitting question that Ladson is known for taking. 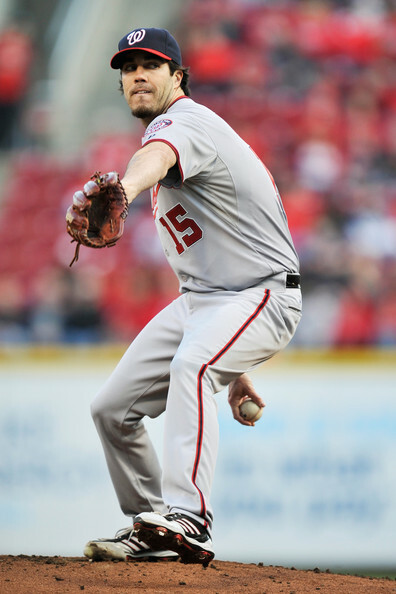 Q: Do you think the Nationals should go after another pitcher or two during the free agency period? A: I think the Dan Haren experience may have scared them off the FA market for a bit. And this coming off-season’s FA market for Starting Pitching is really thin. After spending $13M each of the last two years for Haren and Edwin Jackson (and getting bWARs of -0.1 and 2.0 respectively) the Nats have to be thinking that there’s better ways to spend money. I wouldn’t be surprised in the least to see another deal similar to the Gio Gonzalez deal, where we package a slew of close-to-the-majors players together for one decent-to-good pitcher. The problem would be finding such a team; Oakland’s current slate of young starters mostly struggled this year and none of them are arb-eligible yet. Maybe Tampa lines up; not only do they have to deal with David Price‘s rising salary but Jeremy Hellickson is arb-eligible for the first time too. Hellickson took a major step back though in 2013; would Tampa use this to their advantage and keep him at a lower arb-number for one more year instead of selling low? Would you trade, say, Karns, Roark and Kobernus for Hellickson? Too much? Too little? Ladson says he could see them going after a pitcher either on FA or in Trade. Q: Will Jhonatan Solano be the backup catcher out of Spring Training or will the Nationals try to bring in someone else? A: This is one of the bigger questions for this team this coming off-season: do the Nats go into 2014 with Ramos and a minor league call-up as his backup, or do they go for a veteran backup? I’m guessing they may go the veteran FA route; there’s a ton of catchers on the FA market this year. Jhonatan Solano may have peaked as a player: his AAA slashline as a 27 yr old this year was .214/.245/.279. He’s been bouncing between AA and AAA since 2009. Sandy Leon seemed like he was the future answer, but he bottomed out this year too after looking great in 2012. I’d go with a veteran backup (Kurt Suzuki is a FA …) and wait out the kids one more season. Ladson thinks FA route. Q: Do you think a new manager will be able to change the hitting philosophy of the team and play more small ball instead of over-swinging and trying for home runs all of the time? A: Is that the perception of this team’s offense in 2013? That they over-swing all the time? I think they just don’t hit well in the clutch. 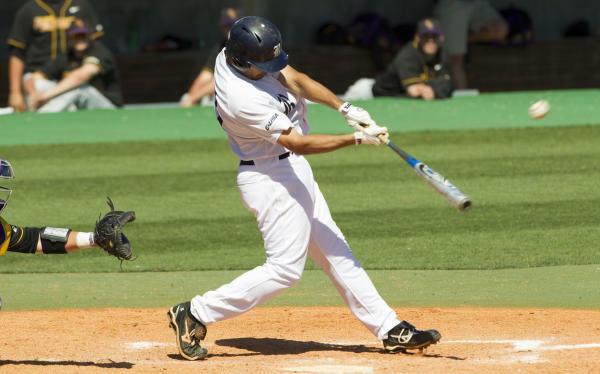 Small-ball is a century old concept mostly debunked by modern stats in the game as being out-dated strategy. 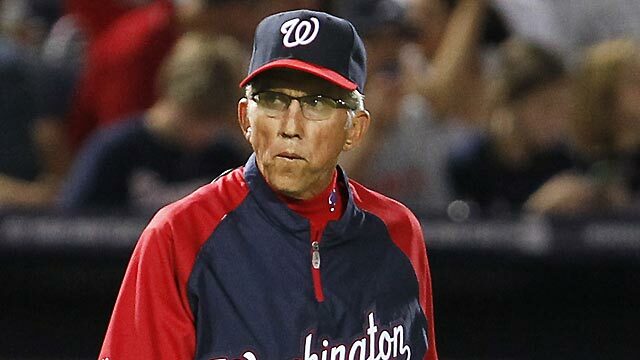 Honestly, I want a manager who stands up for his players, who keeps them in line, who isn’t afraid to order a bean-ball when it is called for, and who doesn’t come across as a feeble old man (sorry Davey Johnson; that’s how I interpreted your last season). Ladson says the hitting has settled since the firing of Rick Eckstein and the hiring of Rick Schu. 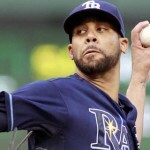 Q: I think that left-hander David Price would be the ideal arm to add to the Nationals’ rotation. 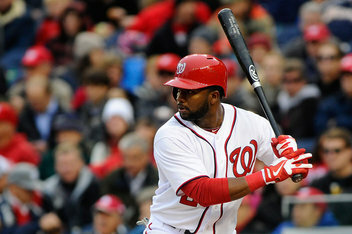 If he is willing to agree to an extension, do you think that he would be a good fit for the Nationals? A: Price would be a great fit on every team in the majors. Duh. The problem is extracting him from Tampa. Tampa is shrewd, drives a hard bargain, and wants to win every trade. They’re not exactly the best team to try to negotiate with. We’ve had this argument on this site many times; what would it really take to get Price out of Tampa? Giolito, Jordan, Kobernus and Rendon maybe? Would you make that deal or is that too much? Of course, that being said … ask yourself this; was starting pitching *really* the reason this team failed in 2013? No I don’t think it was. Yes, the team was 10-19 in Haren’s starts … even if they’d finished .500 in Haren’s starts they were still out of the WC game. No; this team took a significant step backwards offensively. So the way to fix that should be to address the offense. Problem is; all 8 starting fielders are under contract or under team control for 2014. What do you do? Get a couple of bench guys who can hit? How does that help? Ladson punts with his patented ‘lets see what happens’ line. With somewhat of a lack of topics to write about lately, I turned to find a relatively deep Ask Boswell discussion on the Washington Post website 8/19/13. Tom Boswell takes baseball questions, I provide my own answers. As always, I’ll write answers here before reading his, and edit questions for clarity. All stats quoted are as of 8/19/13. Q: Leave it to the Red Sox to make A-Rod into a sympathetic figure! A: Agree. I wouldn’t normally have tuned into the expected 4.5 hour 8pm Sunday night game between Boston and New York, but just happened to see the first Alex Rodriguez at bat last night. My immediate thought: Ryan Dempster‘s actions were pretty gutless and he should have been immediately ejected. You throw at a guy once and miss? You’ve made your point. You had your chance to make a statement and missed. But then throw two more balls inside then blatantly drill the guy on 3-0? Sorry; that’s just bush league. The umpires badly mismanaged that situation; Dempster should have been immediately ejected. Joe Girardi had a very legitimate point at the time, and continued with very intelligent observations afterwards (where, paraphrased, he said that Dempster was a union rep, should have known better, and if he had a problem with the process of his own players’ union the time and place was elsewhere, not on a nationally televised game). So, yeah, Alex Rodriguez did earn sympathy there. How poetic was his home-run later in the game? Were it me, I would have milked it for everything it was worth, making it a poster child for every egregious home-run celebration. Bat flip, slow trot, kisses to the stands, fist pumps and multiple pointing to the sky. But that’s just me. Boswell doesn’t really say much about the question other than stating the obvious about the athlete and the situation. Q: Wouldn’t it be better to show up the Braves by actually beating them once in a while, rather than throwing at them? A: Not the point. As I posted in this space over the weekend, there’s a code in the game that the Nats, for some unknown reason, were not keeping to. Kudos to Stephen Strasburg for finally standing up for his own. It has nothing to do with wins or losses on the field, it has to do with protecting yours. Boswell says the Justin Upton plunking was done perfectly, but then questions the ejection for what a lot of people thought were just very wild pitches to Andrelton Simmons. Q: Why did the Nats not keep Oliver Perez? Q: Who would the Nationals “third-string” catcher be? If, for instance, Suzuki got injured and Ramos pinch-hit. -Who would be the preferred position player to pitch if they ran out of pitchers? A: Great question. 3rd string catcher? I have no idea, maybe Steve Lombardozzi. I do remember the team saying that despite Bryce Harper‘s youth position being predominantly catcher that he was not an option. Pitcher? Boy, another who knows. I can’t remember a single positional player who has taken the mound for the Nats since they moved here. The best guess would be a utility guy, either Lombardozzi or Scott Hairston. Boswell guesses the same names I do. Q: Do you think the Nats will make a serious effort to keep him next year? (I’m already writing off 2013) I’m sure he wants to play every day, but given Ramos’ physical issues that isn’t out of the question. A: Kurt Suzuki is gone. His $8.5M option for next year is way, way too much for what he has become; a once-a-week catcher. Even given Wilson Ramos‘ fragility, you just can’t waste money at the backup catcher position. Look for a 2014 spring training fight between Sandy Leon and Jhonatan Solano for the #2 catcher spot, and look for the team to add a lot of depth in the minor league ranks in the off-season. Boswell notes the horrific catcher ERA of Suzuki compared to Ramos, and predicts a minor FA signing this coming off-season. Q: Is there a more insincere human being in sports than A-Rod? Has he always been like this? A: The above answer was my weekly quota of Alex Rodriguez discussion. I will say this though; how do you really KNOW that A-rod is an “insincere human being?” Do you know him personally? Or are you just following the media narrative? Boswell makes a good point; the damage he’s done to the game outweighs any sympathy you could have for him. Q: You’ve said in the past the Nats would return to their career averages…eventually. Are the Nats reverting to their mean, or is this the new mean? A: If 2012 was the high, maybe 2013 is the low. Lets hope for somewhere in the middle for 2014. Hell, i’ll settle for league average. I did a quick little runs-scored analysis at the end of June that showed where the Nats record would have been if they had a league-average offense (tied for 1st place) or their 2012 offense (best record in majors). You could quibble with the math, but I think we all know what has let down the team this year. Boswell summarizes many of the same points I made … and then has some great stats isolating the bench’s collapse this year. Q: Given Haren’s performance since returning from the DL, does Rizzo make him a qualifying offer for 2014? A: Good question. I just don’t see how you can give Dan Haren a qualifying offer. The Q.O. amount is going to increase; lets assume its $14M/year. Would you give a guy with this stat line $14M? 7-11, 4.79 ERA? Probably not (those are his season numbers). His last 8 games (since coming off D/L?) 3-2, 2.25 ERA. Yeah, that’s worthy of a Q.O. Maybe the team avoids having to make a decision and flips him to someone needing a starter for September, since he passed through waivers. That’d be advantageous to Haren too, meaning his signing next off-season won’t have compensation associated with it. In any case, I think the performance of Taylor Jordan has clearly made Haren expendible, giving as good as or better performance for 1/26th the cost. Use that $13M towards some hitting. Boswell says no. 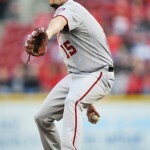 Q: When does Drew Storen replace Soriano as the Nats closer? (After another blown save). A: When Soriano’s contract is over. You bought him, you’ve gotta use him. Rafael Soriano‘s m.o. was always “good when he’s the closer, sullen underperformer when not.” He was a poor signing when they got him, and continues to be wasted money. But hey, its not my money. Boswell agrees. Q: When Magic Johnson’s group purchased the Dodgers, he was going to fire Mattingly, whom you said would be a very good manager. Does he still want to fire Donnie, now that the Dodgers have gone 42-8, the best MLB win stread in 100 years? Would you like to see him managing the Nats? A: Well of course Don Mattingly isn’t going to be fired; he’s now neck and neck with Clint Hurdle for manager of the year. I don’t have a good sense for what kind of manager he is; after Davey Johnson‘s laissez-faire attitude I know what kind of manager I do want; I want someone with some emotion. Girardi proved a lot to me last night; lighting into an umpire who failed to control the game. That’s the kind of emotion I want in my skipper. Boswell gives some good managerial candidates. Q: Who are the young pitchers the Nats thing are coming soon? A: From AAA on downwards, here’s a few starters to keep an eye on: Nathan Karns, A.J. Cole, Robbie Ray, Taylor Hill, Sammy Solis, Matthew Purke, Blake Schwartz, Jake Johansen, Austin Voth and Lucas Gilioto. Almost every guy on this list has performed well and/or earned a promotion in 2013. Boswell points some of these guys out and then mentions that we need to produce some hitting too. Q: Should I be worried that the Nats are going to become the new Caps, a talented team who just lacks the discipline to get it done when it matters? A: No, because at its heart this is still the same basic team of guys who nearly won 100 games last year. They need a new voice in the skipper’s office, one who reverses the course of Johnson and who properly motivates them. Boswell says not to judge a team because of 3/4’s of one disappointing season. Q: Zim’s surgically-repaired shoulder clearly affected his throwing this year — whether physically or mentally. However, his power numbers at the plate are down too, and we haven’t seen his usual late summer hot streak. Do you think his shoulder affected his hitting? If so, what’s the prognosis for next year for Zim’s hitting? A: If his shoulder really is/was as bad as everyone seems to think, then yeah you can derive all sorts of bad performance indicators from it. Next year? Who knows; he should be healthy. Of course, he was promised to be healthy by spring training of THIS year. It takes me back to what I now perceive as disinformation from the team about the whole shoulder issue from the onset. Either way, I think he’s playing 3B for this team in 2014 no matter what (well, unless the team somehow unloads Adam LaRoche). Boswell shows some good stats showing Zimmerman’s consistency over the years, then goes on to rave about Jayson Werth. Q: Will baseball be ruined by the addition of instant replay or have the times changed? A: I think times have changed. But from all accounts, the implementation will be typical of everything MLB does; half-done, ham-handed, inefficient and not going nearly as far as its counterparts. Boswell isn’t a fan. Q: With two years under his belt, he has a 3.00 ERA and a pretty good 27-19 record. He doesn’t hit 100 mph anymore. He hasn’t proven so far to be anything better than mediocre in the clutch. Not a bad track record, of course, but not anywhere near great. He’s 25 years old now. Is it time to adjust expectations? A: Is this a baiting question? Quotes ERA and W/L record as the sole ways to evaluate a pitcher (especially a pitcher who hasn’t yet pitched a full season). What proof is there that he’s “mediocre in the clutch?” He’s still the highest or 2nd highest average fastball of any starter in the league despite dialing it down, he’s still a league leader in K/9. His ERA+ is still significantly above average both for this year and for his career. What more do you want from the guy? Ask any baseball pundit to give you a list of his top 5 starters in the league and he’s still on it. Boswell gives some great historical stats, putting Strasburg in pretty elite company thus far. Q: Why has Bryce Harper not made the 20 year old leap we expected him to? Did the collision with the wall in LA derail his entire season? A: A fair point; everyone saw his splits pre and post-LA wall. His lefty splits are abhorrent. But he hasn’t been the second coming of Mike Trout. Maybe we just need to appreciate him for what he is right now. Boswell mirrors what I said. 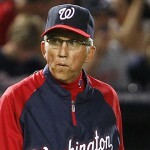 Is it time to fire Davey Johnson? I know this is blasphemous to say. I know it’ll never happen, not under this GM and not under this ownership group, both of whom have far more respect for Davey Johnson than to give him such an ignominious end to his time here. And I know that Johnson is as good of a manager as is out there. I may have been critical of his decisions here and there (especially related to yanking starters on low pitch counts), but I recognize he’s a Hall of Famer and cannot argue against his career accomplishments. But I’m beginning to believe that the only way to shake this team out of its current malaise is to change the message coming from the top. They tried demoting players who weren’t hitting (Danny Espinosa, Tyler Moore). They’ve tried calling up their best remaining prospects (Anthony Rendon, Nathan Karns and Taylor Jordan). They’ve tried cleaning house of underperforming relievers (Henry Rodriguez, Zach Duke, and Drew Storen). They’ve tried changing key staff (firing Rick Eckstein). They’ve tried ridiculous lineups (your best power hitter Bryce Harper leading off??) Nothing has made a difference; the team has basically been playing .500 ball for weeks and weeks now. For whatever reason, this team of players, picked by every baseball pundit out there to make the playoffs and by a good portion to make it to or win the World Series, is now 10 games out of of the divisional lead. They’re 10 games back of Atlanta, which themselves has only played .500 ball since mid April after a 12-1 start. The Nats just finished June and July playing 50 games in a row against teams that missed the 2012 playoffs (perhaps not the best bench mark, since Pittsburgh has the best record in baseball this year, but still), and finished the stretch 5 games south of .500. The team looks like its sleepwaking through games. They look like they have no voice, no spark, no sense of urgency. No leadership. The trade deadline won’t help at all; the Nats have practically no tradeable assets. Their only FAs to be are Dan Haren and Chad Tracy. Kurt Suzuki has a 2014 option that clearly won’t be exercised, so he counts too. But who is out there lineing up for these 3 guys? Meanwhile, despite their offensive woes, there’s really not a spot on the field that can be improved through trade. Go around the field and you’ve got players on deals that at least extend through 2014 (LaRoche and Span), or you’ve got guys on major contracts (Zimmerman and Werth) or you’ve got cornerstone younger players (Harper, Ramos, Desmond and Rendon). Who are you going to replace? Maybe you think about trading Rafael Soriano (after all, the last thing a losing team needs is a high-priced closer) but a quick glance at the teams in playoff contention does not easily find a team in need of a closer (the best candidate may be Pittsburgh, who just lost their closer Jason Grilli to a forearm injury, but they’re not exactly rolling in dollars nor likely to take on an $11M/year guy). Maybe its time to bring in a new voice, and see if he can scare this team into an August and September run. Sorry Davey; you know how the old saying goes. You can’t fire 25 players, but its pretty easy to fire the manager. Well, Phil Mickelson came out of nowhere to take the British Open over the weekend, NFL training camps are coming up soon and the Nats just got swept anemically at home. I wonder how many baseball questions there are in this week’s ask Tom Boswell chat? Lets find out. As always, I answer here before reading Boswell’s response, only take his baseball/Nats questions and edit those questions for clarity. Q: Is one of the reasons for the Nats malaise because they know Johnson is a short timer? 1. I’m not convinced there’s that much “coaching” going on in the majors. Especially for veterans. These guys are professionals, they’ve been playing professional baseball for years. If you don’t know how to bunt, or how to field by the time you’ve made the majors then I don’t think you’re ever going to get it. Maybe I’m wrong. 2. I’m also not convinced that managers really have that much to do with a game’s being won or lost. Yes, disastrous bullpen decisions can back fire. But its still on the hitters to hit, the starters to pitch, the fielders to make plays. Related to #2; word came out today that the Nats have fired hitting coach Rick Eckstein. Is this sort of like firing the secretary when the entire office puts out bad work? Johnson was really upset by it and said so in the media … and I don’t have any doubt that this is a reactionary move to the poor offensive numbers. But ask yourself; what is a new hitting coach going to do to turn this team of hitters around between now and September 30th? Boswell gives Johnson lots of credit in 2012 for instilling confidence in the youngsters and garnering more respect out of the veterans (in comparison to Jim Riggleman). Q: Suzuki, Soriano, LaRoche. Any reason the Nats shouldn’t be sellers this year? A: The Nats will not sell. Because that would be Mike Rizzo admitting that all his moves last off-season were wrong. And he’s not going to admit that. Lets play the what-if game though; what if the Nats were to become sellers. First guys on the block are FAs in their last (or only) year. We only have a couple of those guys: Kurt Suzuki, Dan Haren and Chad Tracy. Look at that list and ask yourself who would want these guys and what they’d be willing to give up? Even newly acquired Scott Hairston is signed through 2014. But then again, teams are smarter and generally won’t give up good prospects anymore for rentals. One last point: the Red Sox blew a 9 game lead in September two years ago. The Nats are only 7 out of the division lead, even playing as poorly as they have. It’s still just mid July. Boswell says wait until July 31st. And interestingly he criticizes the Denard Span acquisition. Q: Can we get rid of Span? A: Ironic that Boswell took this question right after killing him. I have always thought that the Span acquisition was Rizzo being too clever, too focused on defense. And so far it looks like the critics were right. Span is posting an 86 OPS+ right now. His OBP is about the same as the guy we had to jettison to make room for him (Michael Morse). Except Morse at any moment can hit the ball 430 feet; it’d take Span 3 swings to get it that far. To say nothing of driving out a fan favorite/good clubhouse guy. Can we get rid of him? Nope. Stuck with him and most of this team through next season. But, at that point he seems tailor made to flip to bring up someone like Brian Goodwin. Boswell says that Bernadina isn’t the answer. Q: Isn’t it galling to the team that Rafael Soriano acts differently on the mound — e.g., windup vs. stretch — depending on whether or not it is a save situation? A: The word on Rafael Soriano wasn’t positive before he got here, and the whole “shirt untuck” seems to smack of showing people up. And it’s clear to me that he’s a “Save snob;” look no further than his numbers in 2010, 2011 and 2012. In2010 as a closer in Tampa? 226 ERA+. The next year as a setup guy in New York? 4.12 era. Then when Mariano Rivera goes down and he gets the closer job in 2012? Back to being excellent. If he purposely pitches differently in save vs non-save situations? I’d be really, really pissed as a player. But luckily the stats don’t support it; his ERA in non-save situations is better than in save situations, by a lot. Boswell says that Soriano’s behavior is being noticed. great. Q: Should we start platooning Span with Hairston? A: Is this what it’s come to with Span? That we’re talking about platooning him with a guy hitting .170? Yes Hairston’s lefty splits are good … but come on. It isn’t like he’s an all-star slugger. At least span brings plus-plus defense to center. Bat him 8th, where his damage is limited. Boswell says Yes its time to platoon. Q: Everybody says Nats Park can’t get an All-Star Game because the surrounding area isn’t developed enough. But how does that explain sites like Busch Stadium (their development plan is further behind than ours), Angel Stadium (surrounded by parking lots and freeways), or Citi Field (surrounded by parking lots, a subway line, and a junkyard)? A: Great question. Maybe Bud Selig hasn’t seen all the development going on. Or maybe Ted Lerner just don’t want to get on his knees and beg for it before the omnipowerful commissioner. I do think its kind of ridiculous that baseball has chosen to return to parks that have previously hosted before giving a game to every new park. Boswell doesn’t really answer. Q: How good has Gio been over the past two months? A: Before his 6 shutout/11k outing last weekend Gio Gonzalez had won 4 straight starts. The worst of them was a 6 2/3 3 run performance that the team won easily anyway. Maybe he’s pitching to score (ooh, don’t say that too loudly, the sabre nerds get all pissed). Yeah he’s pitching great. Boswell agrees. Q: Should Krol start working later in games? A: I’m still not entirely convinced Ian Krol can be more than a loogy. Every time i’ve seen him, he’s been a one-pitch/one-trick guy. I’ve literally never seen him throw his off-speed stuff for strikes. Luckily the deception and velocity on his fastball are good enough to let him ride to a very good season statistically so far. I’d stick with what we’re doing now; using him and Fernando Abad as situational relievers and leaving the hard work for Clippard and Soriano. Drew Storen? Now that’s another story. Boswell says give him more work. Q: I’ve seen a recent increase in the criticism of Davey Johnson’s managerial decisions. I can’t believe fans are blaming him for where the Nats currently stand. I put the blame on the players. It’s execution that’s at fault. Right? What else could/should Davey do that he hasn’t already tried? A: Stop using poor relievers. Stop pulling effective starters after 90 pitches. Stop batting Span 1st and drop him to 8th where he belongs. That’s what I’d do. Boswell shared some ancedotes. Q: I was so in favor of the Span acquisition, now it just looks horrible. 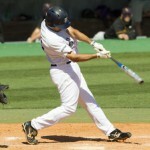 Do you think he can get back to the .392 On Base Percentage he has in 2009 or is he really a .317 OBP guy? Will this team ever solve CF and lead off? A: Just had this discussion with someone over email. He does look horrible at the plate. But he plays a great center field! Rizzo just had to have his center fielder; well now you have him, and the guy he displaced (Mores) has about the same OBP this year as Span. To go along with 200 points of slugging. So there’s that. You say “well Morse has been injured?” I say sure … he got injured in Seattle. No reason to assume the same thing would have happened here. We gave up Morse’s power in the middle of the order and moved a perfectly capable defender (Harper) off center to acquire Span and have him drag down the top of the order. Can’t do anything about it now (or until 2015 frankly): I say bat him 8th until he proves he deserves to return to the top. Boswell points out that Span’s OBP is only 1% better than league average. Q: Should we keep Soriano in the closer role? A: Pretty much; $11M a year and he’ll be a sullen clubhouse cancer if he’s not closing. He’s being paid way too much money to flip, even to teams that covet closers. Well, maybe we can talk to Boston; they seem to be idiots when it comes to paying for closers (as noted in this space). Boswell also mentions Boston but points out how battle-tested Soriano is, implying he has value. I’m clearly on the record in my opinion about closers and paying big money for them, disagreed with the acquisition and disagree with Boswell here; if we could trade him, you do it. Q: Is Jayson Werth immature and/or a hypocrite? A: You’d have to read the whole question (which clearly implies the opinion of the asker), but there’s some vitriol in there. I can’t think of any incidents that make me ever put Jayson Werth in the same maturity category as Nyjer Morgan. I think the questioner is off-base here. Boswell predictably defends Werth. I will say this: go look at Werth’s hitting stats this year; he’s been very, very good. What a week! Both Bill Ladson and Tom Boswell doing chats/email inboxes! As I sit here as my flight has been delayed a second time, I find myself with the time to bang out Ladson’s latest inbox. As always, I write my response here before reading Ladson’s and edit questions as needed for clarity. Q: With right-hander Dan Haren going on the disabled list, is it possible the Nationals will try and trade for left-hander Cliff Lee or another top-of-the-rotation pitcher near the Trade Deadline? A: Rumors on the street are that Mike Rizzo is working the phones, hard. That sounds to me like he’s looking for serious reinforcements to try to salvage this “go for broke” season. But somehow I seriously doubt it’ll be Cliff Lee. Lee is owed too much money, he’s already 34, and the likelihood of Philadelphia dealing intra-division seems remote. There’s plenty of other pundits out there reviewing the likely pitchers on the Trade market and there’s some intriguing names out there. But it’ll be a sellers market and the Nats farm system has already been thinned recently. Will they thin it even more in a desperate attempt to keep the 2013 dream alive? I hope not; we’re already seeing how poorly thought out trades by other teams in similar positions have backfired and cost their teams significant prospect depth. As others have noted, Ladson predicts the callup of Taylor Jordan for the time being. Lets hope he comes out of no where and pitches 6 shutout innings. 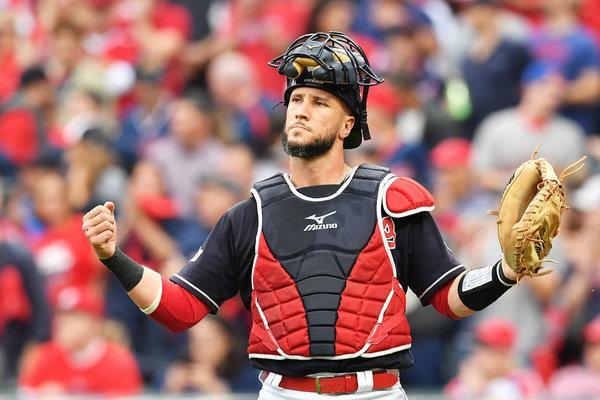 Q: Does Wilson Ramos remind you a bit of Jesus Flores — a promising young catcher who can’t seem to stay off the disabled list? A: Yeah, except that Ramos is twice the size of Flores and still can’t stay healthy. That Kurt Suzuki move is looking better and better. Derek Norris has yet to really pan out in the majors for Oakland (hitting below .200 this year and for his career), and Suzuki is holding down the fort for now. That being said, we need Ramos back to spell Suzuki, who seems to be tiring as he catches the large majority of the innings. Ladson doesn’t say much … but says the Nats miss Ramos. Duh. Q: Is there any chance we might see Ryan Zimmerman at second base? A: Zero chance. He’s a big dude; he’s not a 2nd baseman. Now, Anthony Rendon looks like a 2-bagger to me. 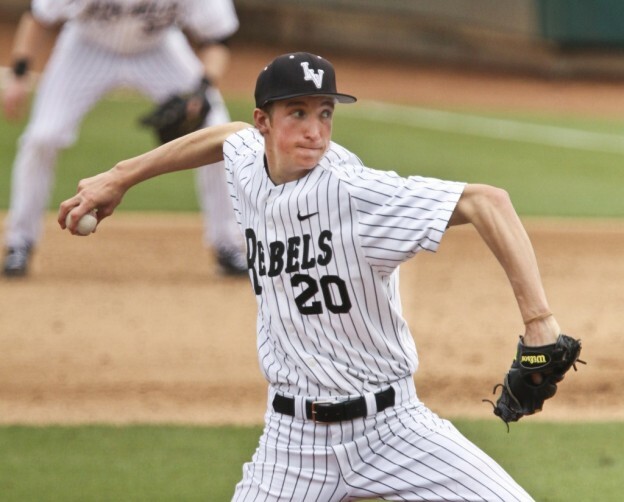 Shorter guy, agile, quick arm, good glove. Ladson agrees. Q: What do you think of the Nats’ start this year, compared to last? Are they a stronger team? A: Lots of injuries, lots of under-performing on the offense, and a couple of depressing pitching issues. They’re better than a .500 team but they need to have at least a league-average offense (not one of the worst). Ladson says they need Harper back. Duh.